A big part of every good hockey team, is an even better goaltender. The Laurier men’s hockey team are heading to the playoffs, with home ice advantage in the first round. A key factor behind their great season thus far has been starting goalie, Colin Furlong. 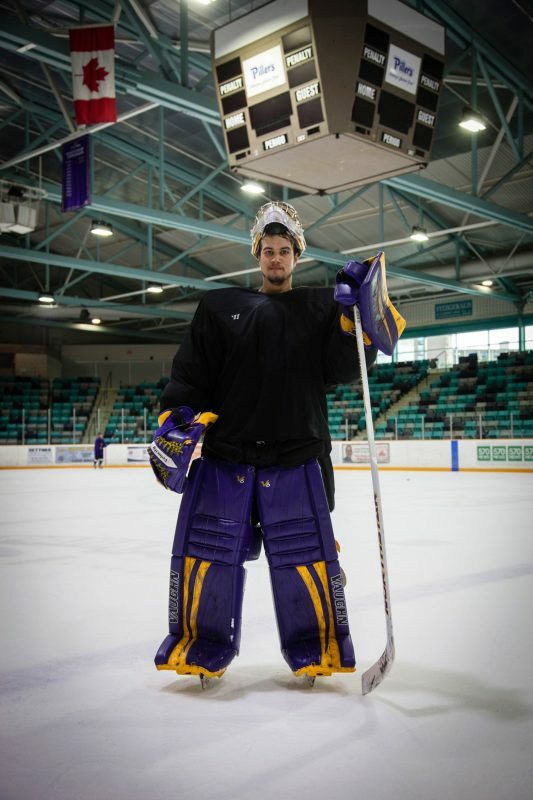 Furlong was named Laurier’s athlete of the week on Feb. 6 for his magnificent performance against the Toronto Varsity Blues, in which he earned the first shutout of his career, posting 25 saves for the win. Furlong and the rest of the Hawks have come into their own as of late, winning five consecutive games to close out the regular season. The second-year goalie talked about what has worked for the Hawks as of late. “We’ve just been playing our type of game. When we tend to stray away from that, we kind of get in trouble. We just have to get everyone on the same page and buying into our system and just having guys commit. I think we’ve done that in the last month or so. That’s what we need to keep doing,” he said. Goaltenders are always under the microscope and every mistake made by goalies is magnified. This unmistakably adds extra pressure on goalies and makes it one of the hardest positions to play in hockey. “I just try not to think too much. As the goalie, if you make a mistake, it’s always going to be a goal. I’ve been doing it my whole life, so it’s just routine now. But it’s about not overthinking, just going out and playing, just trying to make the save for the team is the big thing,” Furlong said. The Cambridge native has been playing hockey since he was seven; it’s no surprise to see him playing at such a high level. Furlong was on the team last year as well, but the Hawks record wasn’t quite as impressive. When asked to comment on the team’s turnaround, Furlong gave all the credit to his teammates. “We had a strong recruiting class this year. We have some good, young talent, but we also have some of the veteran guys who are talented and can score, but can also play a gritty game. Our young guys can also do the same; they can be skilled, but they can also hit and grind in corners,” he said. The Hawks wrapped up the regular season with a 3-2 victory against the Windsor Lancers. They had also beaten Windsor earlier in the season with a 2-1 win. Both of those victories could be very helpful for the Hawks as they will face the Lancers in the first round of the playoffs. Even though those regular season games were important, the playoffs are a different beast and the added pressure will make it that much harder for the Hawks. “The playoffs are definitely a whole different game. But I think it’s good for morale, knowing that we have had a little bit of success against them. But in the playoffs, it doesn’t matter if you’re first or eighth; it’s a whole different game,” said Furlong. The good news for the Hawks is that they have home ice advantage in the first round. If the two regular season games against Windsor were any indication of what’s to come; the playoff games should be nerve-racking. It won’t be easy for the Hawks. And after his impressive season all eyes will be on Furlong.